The Mississippi State Chemical Laboratory performs analyses of animal feed, human foods, pesticides, herbicides, and everything in between. The laboratory is an important strategic partner with the Mississippi Agricultural and Forestry Experiment Station and one that includes strong, familiar ties. State chemist Dr. Ashli Brown and associate state chemist Dr. Darrell Sparks are scientists in the Mississippi Agricultural and Forestry Experiment Station and professors in the Department of Biochemistry, Molecular Biology, Entomology and Plant Pathology. Both Brown and Sparks direct graduate student research in the College of Agriculture and Life Sciences. This connection provides numerous opportunities for faculty to collaborate with the chem lab. This collaboration assists livestock and row-crop farmers, food processors, and feed manufacturers, ensuring a safe and plentiful food supply. MAFES scientists and farmers alike turned to the Mississippi State Chemical Laboratory for help when a laboratory that conducted forage testing closed. Livestock farmers frequently feed hay in winter months when foraging grasses are not available. Users and buyers of hay are increasingly interested in the nutrient profile of forage to determine supplemental feeding requirements. Similarly, when agricultural companies began releasing corn, cotton, and soybean varieties that contained 2,4-D and dicamba herbicide resistant genes, MAFES scientists turned to the Mississippi State Chemical Laboratory for assistance. The herbicides, which have been around for over 50 years, are effective at killing weeds, but carry unintended consequences on non-target plants through volatility and drift. The Mississippi State Chemical Laboratory developed tools to determine the formulation used in off-drift damage so that the source could be identified. The lab also analyzed tank cleaner efficacy for herbicide removal and improved spray application methods. These analytical tools aid in promoting good stewardship programs within the farming community. Another issue that can be costly for livestock and row-crop producers is also a food safety concern. Aflatoxins are highly carcinogenic and can infect numerous crops including cotton, peanuts, and corn during production, harvest, storage, and processing. Also, feed manufactured from infected plants can cause aflatoxin in milk and dairy products. Aflatoxin is caused by Aspergillus flavus, a fungus found in the soil. The Mississippi State Chemical Laboratory is working with the USDA Agricultural Research Service and MAFES to develop tools to assist with aflatoxin detection and development of hybrids that are resistant to the fungus. One tool created by the chemical lab is the single kernel assay. By singling out aflatoxin in an individual kernel and comparing differences in genes and protein between infected and non-infected kernels, a cob blueprint can be created to help unlock the resistance code to determine aflatoxin spread in corn ears. 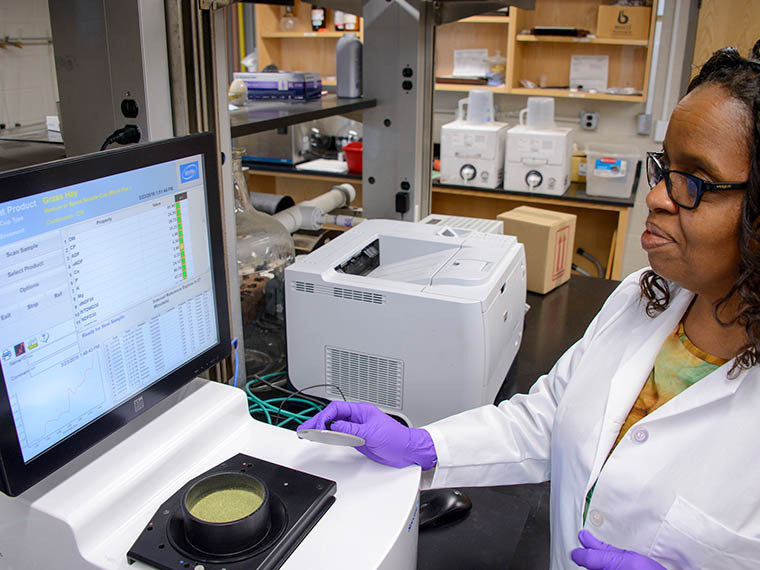 The Mississippi State Chemical Laboratory in conjunction with USDA ARS scientists are working to use this information to aid in breeding strategies for resistance to aflatoxin. The Mississippi Agricultural and Forestry Experiment Station is proud to partner with the Mississippi State Chemical Laboratory to improve agricultural production in the state.